This month’s Recipe Redux is our favorite chocolate pairings, since it is February after all. Of course I love chocolate and will eat it will just about anything. It was no easy task settling on my favorite healthy pairing. But I do love chocolate with fruit and I absolutely adore it with caramel. My love for caramel almost rivals my love for chocolate. So why not combine the three? I was so inspired on the caramel front that I figured out how to make homemade caramel sauce in the microwave, which took less than 5 minutes! I’ll admit that I often need a sweet or chocolate fix after a meal. Usually just a small bite will do. 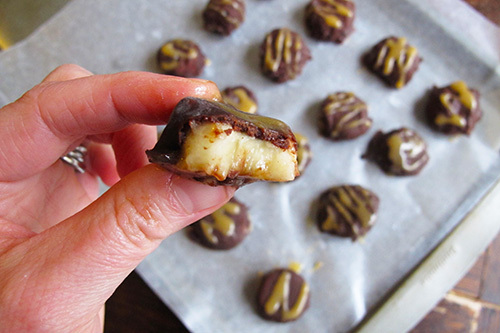 And these Chocolate Caramel Banana Bites are just that. They are a frozen treat and if you’ve never tried the whole frozen banana ice cream thing, then you totally need to change that – it is amazing how creamy the banana gets when frozen. I was skeptical myself, but these, well, are just simply amazing. I felt like I was indulging in a luxurious bonbon. The caramel on top gives it a little extra something, though you could totally do without it and be very happy. 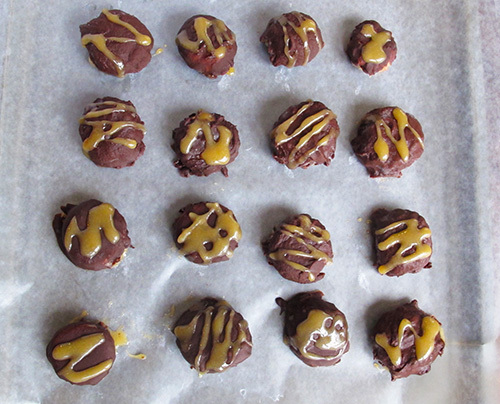 I did try several variations, even going so far as to dip the bananas in the caramel sauce first, flash freezing for about an hour and then dipping in the chocolate. I felt it wasn’t quite worth the effort, however. Rather than creating a separate caramel layer, much of it slid off into the chocolate sauce or on the pan before I ever even got it into the chocolate. So drizzling the caramel over the chocolate after the dunking was a better option. 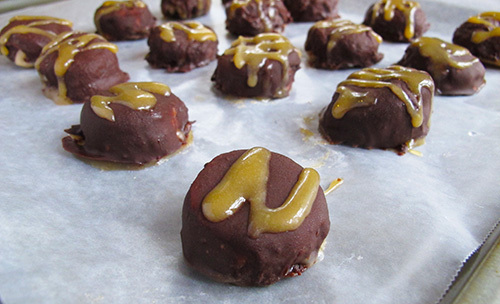 These are a simple treat to make and taste great straight from the freezer. Combine the chocolate chips and chocolate square in a microwave safe glass bowl. Microwave in 15 second intervals, stirring between, until chocolate is melted. Stir in the canola oil and milk. Add more milk as needed to make it easier to dunk bananas. Using a fork, dunk each banana slice in the chocolate. Cover completely then carefully remove, scraping the bottom of the fork on the edge of the bowl to remove excess chocolate and place on the wax paper. Repeat with all of the banana slices. 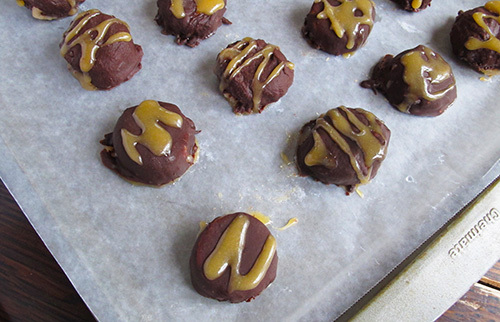 Using a spoon, drizzle the caramel sauce over the chocolate covered bananas. Place the sheet pan in the freezer and freeze for at least 6 hours or overnight. Put the chocolate and caramel covered bananas in an airtight container and place back in the freezer. Eat directly from the freezer! You could use store bought caramel sauce in place of the homemade, but this is so easy to do in the microwave and only takes 5 minutes, I highly recommend making your own! See what other fun chocolate pairings my fellow Reduxers created below.